NCERT Solutions for Class 6 Math Chapter 4 Basic Geometrical Ideas are provided here with simple step-by-step explanations. These solutions for Basic Geometrical Ideas are extremely popular among class 6 students for Math Basic Geometrical Ideas Solutions come handy for quickly completing your homework and preparing for exams. All questions and answers from the NCERT Book of class 6 Math Chapter 4 are provided here for you for free. You will also love the ad-free experience on Meritnation’s NCERT Solutions. All NCERT Solutions for class 6 Math are prepared by experts and are 100% accurate. (a)	The five points are D, E, O, B, and C.
Name the line given in all possible (twelve) ways, choosing only two letters at a time from the four given. (a)	Line containing point E.
(b)	Line passing through A. (d)	Two pairs of intersecting lines. How many lines can pass through (a) one given point? (b) Two given points? (a)	Infinite number of lines can pass through a single point. (b)	Only one line can pass through two given points. (a)	Point P lies on . 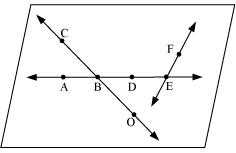 (b)	 and intersect at M.
(c)	Line l contains E and F but not D.
(d)	 and meet at O. Consider the following figure of line . Say whether following statements are true or false in context of the given figure. (a)	Q, M, O, N, P are points on the line . (b)	M, O, N are points on a line segment . (c)	M and N are end points of line segment . (d)	O and N are end points of line segment . (e)	M is one of the end points of line segment . (f)	M is point on ray . (g)	Ray is different from ray . (h)	Ray is same as ray . (i)	Ray is not opposite to ray . (j)	O is not an initial point of . (k)	N is the initial point of and . Classify the following curves as (i) Open or (ii) Closed. (a)	Open curve (b)	Closed curve. Draw any polygon and shade its interior. (a)	Is it a curve? (b)	Is it closed? (a)	A closed curve that is not a polygon. (b)	An open curve made up entirely of line segments. (c)	A polygon with two sides. (c)	This is not possible as the polygon having the least number of sides is a triangle, which has three sides in it. Name the angles in the given figure. (a)	One point in common. (b)	Two points in common. (c)	Three points in common. (d)	Four points in common. (e)	One ray in common. ∠COD and ∠AOB have point O in common. ∠AOB and ∠BOC have points O and B in common. ∠AOB and ∠BOC have points O, E, B in common. ∠BOA and ∠COA have points O, E, D, A in common. Ray is common between ∠BOC and ∠AOC. Draw a rough sketch of a triangle ABC. Mark a point P in its interior and a point Q in its exterior. Is the point A in its exterior or in its interior? Point A lies on the given ΔABC. (a) Identify three triangles in the figure. (b) Write the names of seven angles. (c) Write the names of six line segments. (d) Which two triangles have ∠B as common? Draw a rough sketch of a quadrilateral PQRS. Draw its diagonals. Name them. Is the meeting point of the diagonals in the interior or exterior of the quadrilateral? Diagonals are PR and QS. They meet at point O which is in the interior of &mnSq1PQRS. (d) Two pairs of adjacent angles. (a)	Is every diameter of a circle also a chord? (b)	Is every chord of circle also a diameter? (a)	Yes. The diameter is the longest possible chord of the circle. (a)	Two diameters of a circle will necessarily intersect. (b)	The centre of a circle is always in its interior. (a)	True. They will always intersect each other at the centre of the circle.